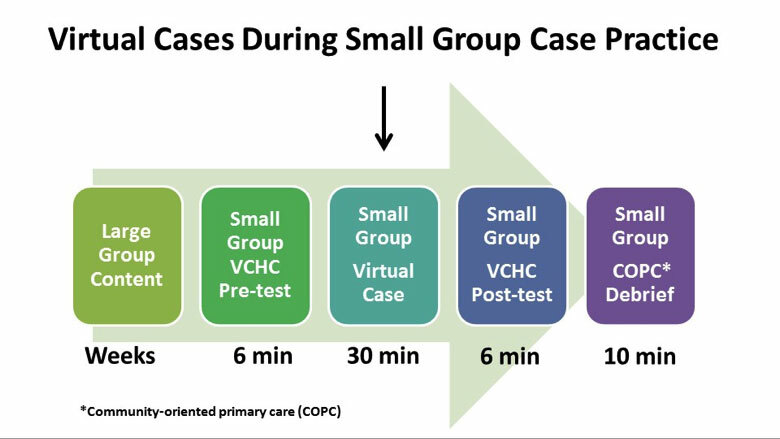 During academic year 2014-15, 108 first-year students completed 14 Virtual Community Health Center (VCHC) case studies. Pilot data were collected in four domains: clinical reasoning, engagement, student peer collaboration, and community oriented primary care (COPC) awareness. In addition, A.T. Still University’s School of Osteopathic Medicine in Arizona (ATSU-SOMA) piloted one case study with residents. Preliminary data collected from exit surveys indicated that the students and residents found the case studies useful. During the next academic year (2015-16), the VCHC team will continue to analyze and report outcomes data as part of the formal evaluation of the project. There are plans to scale the project vertically into the second year of medical school in academic year 2015-16, as well as horizontally and interprofessionally between schools at ATSU, as well as to collaborate with schools and technology partners outside ATSU.